Free Podcast Available! Watch Now! Individual License (for a single user). Site License (for use within a 50-mile radius of the primary point of use). Corporate License (for global use, limited to the employees of a single agency or corporation). NOTE: The Automated Text Reader provides access to all the information contained in the individual sections of the NPRD hard copy product. Within each individual section of NPRD, the tool provides basic search and browsing capabilities that allow for locating the information of interest. *NOTE: The CD-ROM, download and Automated Text Reader versions are not PDF versions of the Hardcopy document. The CD, Download and Automated Text Reader formats operate in Windows XP, Vista, 7, 8, 8.1 and 10 environment. The subscription version will work on any operating system including Apple Mac machines. This product is also offered as a subscription. Click here to view subscription options. Contact us by email or calling (315)-732-0097 for multi seat licensing or for purchasing multiple Hard-copies for a discount. 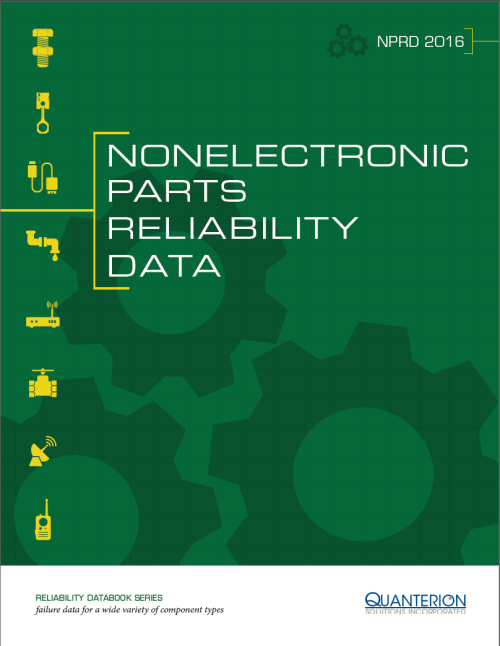 The 2016 Edition of the Nonelectronic Part Reliability Data publication (NPRD-2016) presents failure rate data on a wide variety of electrical assemblies and electromechanical/mechanical parts and assemblies. Compared to its predecessor NPRD-2011 publication, NPRD-2016 adds 138,000 new parts and over 370 billion part hours, representing approximately a 400% increase in content. The expanded part types and data in NPRD-2016 cover ground, airborne and naval environments. Accurate and timely reliability predictions are an important part of a well-structured reliability program. When properly performed, they can provide valuable insight into the design and maintenance of reliable systems. While there are well-accepted reliability prediction methodologies for standard electronic components such as MIL-HDBK-217, “Reliability Prediction of Electronic Equipment” and the 217PlusTM System Reliability Assessment methodology (currently at 217PlusTM:2015), there are few such sources of failure rate data for other component types. 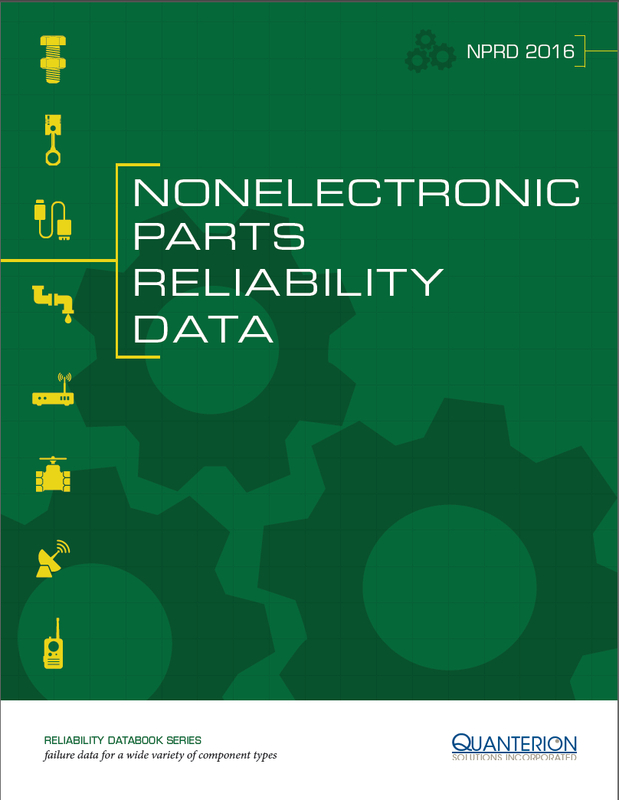 A potential use for this document is to complement existing reliability prediction methodologies by providing failure rate data in a consistent format on various electrical assemblies and electromechanical/mechanical parts and assemblies. Although the data contained in this publication were collected from a wide variety of sources, everything possible has been done to screen the data such that only high quality data is added to the database and presented in this document. In addition, only field failure rate data has been included. The NPRD-2016 user should note that the use of any reliability prediction technique, or the use of the data contained in this book, should complement (not replace) sound reliability engineering and design practices. NPRD-2016 provides historical reliability data on a wide variety of part types to aid engineers in estimating the reliability of systems for which their own data does not already exist. Sound reliability engineering practices must include knowledge of the failure physics of all critical components, modules and interconnection assemblies in a system. Knowledge of life-limiting failure mechanisms and how these mechanisms will behave in the intended use environment is also necessary. Only in this manner can robust designs be ensured. Copyright © 2015 by Quanterion Solutions Incorporated. This publication was developed by Quanterion Solutions Incorporated. This document (hardcopy and electronic versions) is protected by U.S. Copyright Law and may not be copied, automated, re-sold, or redistributed to multiple users without the express written permission. The copyrighted work may not be made available on a server for use by more than one person simultaneously without the express written permission. If automation of the technical content for other than personal use, or for multiple simultaneous user access to a copyrighted work is desired, please contact 877.808.0097 (toll free) or 315.732.0097 for licensing information.